Well, it may be a bit more than eight hours when all is knit and bound off. But it is a fast knit, this baby blanket that I am making for my little Christmas baby. I got it out of this book. Lots of baby-blanket patterns, all of which use only four balls of Encore Worsted yarn and a size 13 needle. I selected the Pinwheel Baby Blanket for its visual interest. Plus it just seemed boyish to me. It is supposedly the most difficult pattern in the book, which scared me at first, but it is turning out to be just fine for a knitter like me (with only about a year and a half of experience). 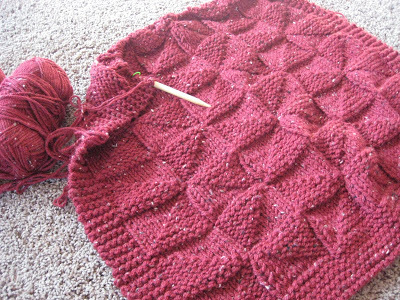 I’m more than half-way done, and what I like about this particular pattern is that it keeps my interest. Hope to have it done in another week or so. Knowing how much I get to knit per day (not much), this seems doable. Well, happy October weekend, friends! It is unseasonably warm here. I am ready for crispness in the air. My pregnant ankles are ready, too. Cute pattern. It should be nice and cozy when the cold comes! PS Put those ankles up! i don't think i like you anymore. really. 8 hours? it took me 2 years to knit a pair of socks! So cute!!! I like the color too! and yes, do put those ankles UP! that's an order!